I have an embarrassing amount of support in my life. I have several separate groups where I am accepted, supported, even loved. I have the Jubilee Spiritual Community, my funky unchurch (it’s sure not your gramma’s church) here in Asheville – which in times past has been more vital to me, but still is important as a base of many friendships and a venue for my poetry and stand-up comedy. I am out about my bipolar disorder there. I know that I am loved there – and that there are many people (some of whom also go only seldom or not at all) whom I genuinely love. I have the Asheville Movement Collective ecstatic dance community, where people share not just dance but often become real friends. When you are all making yourselves vulnerable together by taking the risk of authentic movement, intimacy tends to spring up. I have the Magnetic Minds depression and bipolar support group: these are really my people and it feels like my real mission is to and for these people. This extends to wider circles of bipolar people, whom I reach through this blog and through the online healing community which I am developing for people with bipolar disorder. I have my grocery store community: our staff and staff-and-customers overlapping communities offer genuine support and at times even love. For the last several months, I have been passionately involved in the Sun Soo Tae Kwon Do community. In a couple of weeks I am going to the birthday party for an eight-year-old girl, who apparently thinks I’m her grandfather for the way she has adopted me. Need I say more about community? I’ve been averaging four Tae Kwon Do classes a week. The 12 steps of AA and OA. Corny? Rigid? Oppressive? Too religious.? I have thought all of these things about these steps. Deep and in some ways mystical? A potent vehicle for personal/spiritual transformation. I’m getting an intuition that, for me, it may turn out to be both of these things. After a couple of months with a “food sponsor” who then moved away, which really kind of worked for me, I never got a sponsor. Except for that transitional sponsor (we signed on as a trial, then when she decided to move away she wanted to lighten up her commitments, I couldn’t find a sponsor who would work with my limits: I don’t want to weigh and measure my food. I don’t want to submit a food plan for each day. I need more spontaneity or I will totally act out or leave. It really did work for me to report every evening the food I ate that day. Just this took a lot of discipline. This accountability boosted my moment-to-moment mindfulness of my eating and helped me to make better food choices. 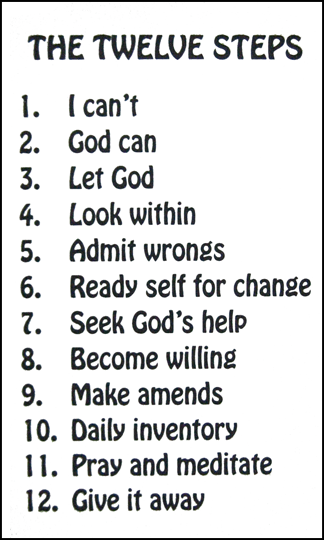 I never immersed myself in the 12 steps, which is where the spiritual transformation happens. To really work the steps, you need a sponsor – so these two problems interface with each other. I have an intuitive feeling that the steps can be very powerful for me – could maybe be exactly what I need next spiritually. I do know that after several weeks depressed, yesterday (four days into my new food regimen, which I will describe in a separate post) I started to feel good. No mania that I can see yet, but feeling good. Is it getting away from sugar, off of wheat, off of caffeine? Maybe all of this. Maybe also my new meds, which I have been gradually increasing for several months now. I may never fully know. Oh well, that’s enough for now – more to come, I’m sure. Jill and I know each other from the grocery store, but even more from Interplay – a personal growth methodology featuring improvisational movement, story-telling and song. The overall tone of Interplay is playful, but the work is also “sneaky deep”: the spontaneous quality of people’s participation allows you to know each other much more deeply and more quickly than would usually be the case. So, while in absolute terms Jill and I have not spent a lot of time 1-1, we still feel like we know each other pretty well – and i would say that we actually do. And she reads this blog. This took my breath away and immediately made it clear to me that I had to get back on my pony and write. And revealed to me why I have not been writing. More than half the time I have been depressed – and kind of brutally so, more than for a long time. But I have also mostly not been writing even when I’m up. I think that underneath the ups and downs I have had an underlying discouragement about making a difference to people – do I really have anything to say? I had another project at the same time, a blog specifically about bipolar disorder: bipolarintegrity.net. “For my cohort and those who try to help, love or live with us.” From my current, momentarily clear vantage point, there’s a lot of really great stuff on that blog – check it out! But two years ago, it also had ground to a halt. So one day at work I had an aha: if these big, weighty projects are stuck, write about what’s right in front of your nose – what goes on in the grocery store. Lots of great stuff goes on here. You talk about it a lot, so why not write about it? Those other two projects may come off the shelf in time, but for now you will be writing. That may at some point generate the momentum that one or both of those projects need. For the first 24 hours after this idea was hatched, I told myself that I would leave bipolar disorder out, “just to keep it simple”. Right…! By Day 2 it became obvious to me that trying to leave out everything that refers to my bipolar disorder would gut the integrity from the blog. It won’t be about bipolar disorder, but will provide a window into the life of someone who happens to have bipolar disorder. Similarly, I am a lot more than this cashier in the grocery store. But lately I have mostly not been writing on the blog. When I am up, I write lots of little notes at my cash register and during my breaks – but in my mania I never get around to organizing them into a post. When I’m down, nothing happens. The net result is lots of discouragement. If this is my interim life purpose and it’s dormant, then what does that say about my life? Jill today shined a light on all of this. My life purpose can be expressed in writing projects like online training for healing from bipolar disorder or this blog, but it can’t be held by them. My life purpose is to make a difference in people’s lives. If I focus on that at work (and elsewhere), the aliveness that comes out of this may spill over into writing – like now, tonight, after my encounter with Jill today. That mid-day connection with Jill triggered more than this writing. For the second half of my shift, I was on fire for making a difference for people. I’ll describe some of those encounters in another post.